O.M.G. Winter meets don't get much better than this. I don't really know why I'm writing a meet report for this trip; it will live forever in the memory of those who were on it. This weekend's weather and conditions was truly the stuff of legends... for decades to come, long-serving members will surely invoke "Glencoe... 2016..." as the meet by which other winter meets are gauged, and go misty eyed at the thought of what Scotland in winter can be like when it's at its best. Weekends like this exemplify what a past club member (AlisonW) once said to me of Scottish Winter: "you've got to be in it to win it". The promise of weekends like this are what keep us coming back into (more often than not) the teeth of the gales and the blizzards and the clag, hoping, maybe, just maybe, this time... this might be one of Those Weekends. Anyway, this time it finally was well and truly actually awesome. Right place, right time, right company. Except for Sim, who clearly doesn't have the right car; it broke down and she couldn't make it. This wasn't a "deep freeze" winter weekend of frost-nip and icescrews and hot-aches, mind you. No, but it was one of light winds, sunshine and perfect snow conditions on the high ridges and other fine mountaineering lines on Scoland's mountains. 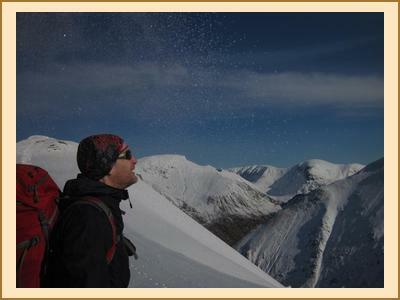 "The Munros are at their very best at the moment" Martin wrote to me in a pre-meet email. And they were. On Saturday, Helen, Paul (up just for a day trip; the conditions were worth travelling for) and myself ticked off a long held wish to do a winter Aonach Egach traverse, which was as excellent as hoped. Not too busy on the ridge, and we traded abseil setups with another party. Meanwhile Claire, Kat, Philip and Antti were having a "belter of a day" across the way on a Bidean traverse along the "christmas cake icing" ridge. In the other direction Tony was also nearby on Garbh Bheinn. Kate, Allan, Alison and Perry were repelled by the Stob Dubh's steep Glen Etive slopes and avalanche concerns; they will be back with a "grass axe" when there's no snow. Chris was latest back to basecamp, bagging two Glen Etive Corbetts on a day "about three hours longer than he would have liked". 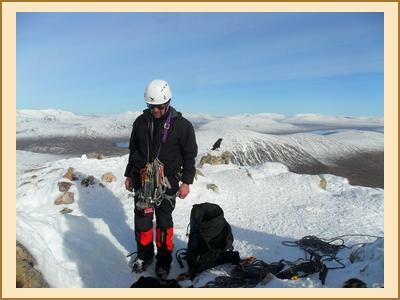 Mike and Fiona did that club favourite East Ridge of the North top of Stob Ban. Allan and Anne went round to Glen Nevis and did the Ring of Steall, and Alison, Kenny and Fiona headed for Aonach Mor and did Western Rib. Martin, Keith and Harry did Schoolhouse Ridge on Beinn a'Bheithir above Ballachulish; the characteristic arc of the ridge connecting Sgorr Bhan to Sgorr Dearg - sharpened to a snowy cusp - was certainly a distinctive feature of the skyline this weekend. On Sunday, Curved Ridge was a popular choice with three parties (Martin, Kenny, Tim, Helen, Mike and Fiona) off up it. Mike and Fiona managed to solo ahead of the parties ahead of us, get down early and - after a pause for chips & cake - decided it'd be a waste to not use the rest of a fine day so polished off Stuchd an Lochain for dessert. Kate, Allan, Alison and Perry did the Glen Orchy Corbetts (Beinn Bhreac-liath and Beinn Udlaidh), reporting brilliant views... including a huge avalanche on the east side of one of the hills between Glens Etive and Kinglass. Alison and Fiona went hunting obscure routes at the Boomerang Arete end of Stob Coire nan Lochan. Claire and Antti had to head back to Edinburgh but still managed a 15km run south along the WHW from the Kingshouse with fine views of the Black Mount. Philip had stroll along the wee Buachaille (encountering several guides and clients; apparently it's used as some sort of "training ridge"). Tony did Beinn a'Chrulaiste from Kingshouse with magnificent views but surprisingly hard work trail blazing. Chris did Fraochaidh and Katrina did Schoolhouse Ridge. I'll finish with a few selected quotes from post-meet emails: "will live long in the memory"..."More like this please"..."the most wonderful meet"..."meets are always great...but this time the weather cooperated"..."Memorable weekend ... Probably the best weather I've ever had on an EMC meet!"